Little did I know upon my arrival at Broadway’s Booth Theatre that my all-time favorite film, “It’s A Wonderful Life,” would have a starring role alongside Will Chase and Malcolm Gets in this sentimental and spare musical. A musical so spare, I might point out, that the non-existent second act is the one you're supposed to discuss on your way home, according to its creators Neil Bartram (score) and Brian Hill (book). But there it is, as The Story Of My Life’s score and book unrepentantly and continually raise the specter of George Bailey and Clarence throughout. At times, the parallels are brilliant. Yet at others, it's so haunting that it becomes borderline creepy. In The Story Of My Life, two lifelong friends influence each other’s ultimate path. It’s their seemingly inconsequential, shared experiences that reverberate through their lives with all the effect of a butterfly on the weather. One, Alvin Kelby (Gets), stays behind in their small hometown to help run the Writer’s Block bookshop owned by his ailing father, while the other, Thomas Weaver (Chase), is not only inspired to write, but goes on to great success, that is until he suffers from -- you guessed it -- his own writer’s block. While the Frank Capra classic receives prominent mention, it’s another movie, “Groundhog Day,” that I couldn’t help but think of each time the musical’s moment of truth appeared to be at hand. Over and over during the course of this 90 minute show, The Story Of My Life’s assured actors repeat one defining moment of their friendship. While each successive pass gets them further and further, they never truly break through to the truth Weaver seeks, but they certainly manage to arrive at a somewhat satisfying conclusion from Kelby’s perspective. 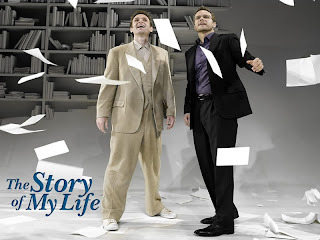 The Story Of My Life is one of those quaint little feel good musicals that would surely feel more at home on an Off-Broadway stage. While far from a big Broadway blockbuster, it's sweetness is hard to resist. What I like most about it is that it doesn’t try to disguise its clichés. Even the eccentricity the show celebrates — in the person of Alvin, the misfit motherless son of a bookstore owner — is perfectly conventional. A comment that broke the rules has been deleted.